Fuzzy Matching for Excel (Fuzzy Duplicate Finder) is an Excel add-in for finding and/or removing all partial duplicates, typos, misspelled words and similar records from an Excel list or a selected range. Fuzzy Matching finds partial matches for queries whereby one or more character symbols are different from the searched text string. Fuzzy Matching for Excel allows to specify the number of different characters for a particular search (1 to 10) and all entries are returned, whether they have omitted, excess or mistyped symbols from the base text. The search results are displayed in a pane, either to the left or right of the workbook to view all found instances at a glance organized by groups. Fuzzy Matching duplicates found can be updated automatically with the base text or manually corrected individually. Search a whole worksheet, column or a selected range. Option to split cells into words and process words separately. Choose to exclude cells or words with fewer than the specified number of characters. Option to correct the same values written in a different case (Lower, Upper, Proper). Export the search results to another worksheet for reviewing. Specify the maximum number of different characters - from 1 to 10. Function to exclude cells or words with fewer than the specified minimum number of characters. Automatically set the correct value to all items, some items by group or individually. Remove duplicates based on fuzzy matching criteria. Compatible with all versions of Windows XP to 7 and Excel 2000 to 2010. 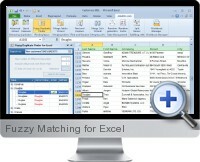 Fuzzy Matching for Excel is also available at a discounted price in the Excel Add-ins Collection Download.